Nations Press news LOOK: Dela Rosa to "Narco-Cops": This is The Worst!! LOOK: Dela Rosa to "Narco-Cops": This is The Worst!! 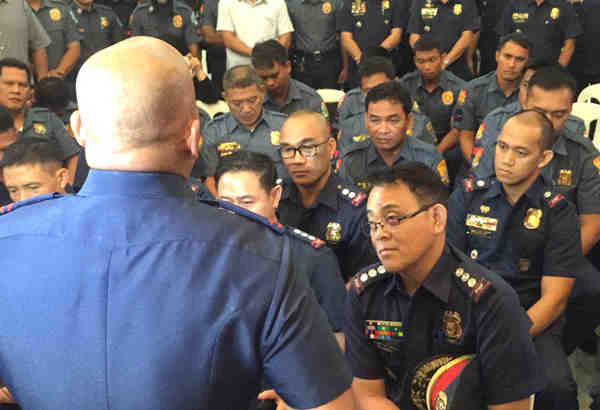 SPONSORED LINKS From curses to fist fights, Philippine National Police Director General Rolando “Bato” Dela Rosa gave some officers a rude welcome on Monday morning after their names were included in a list of those who are allegedly behind the continuing proliferation of the drug trade in the country. Known for his cool personality, a different Dela Rosa was seen as he talked to the cops who have the ranks of Police Officer 1 up to Superintendent. “Hahantong tayo sa puntong lahat ng tao siraulo dahil pulis mismo nagre-recyle ng droga, pulis mismo nag-bebenta ng droga,” the PNP chief, who was obviously dismayed over his wards, said.